This week&apos;s Free Stuff Friday giveaway is a tasty one! 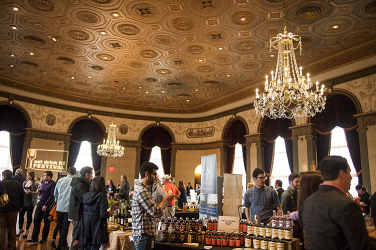 Win a four-pack of tickets to the Grand Tasting at the Eat Drink RI Festival happening May 2 in the ever luxurious Grand Ballroom at the Providence Biltmore. Tickets to this event are valued at $75 and include all food and beverage samplings. Enter here for a chance to win this great prize. The Eat Drink RI Festival is a four-day food extravaganza showcasing all of the best food in Rhode Island. The festival runs from April 30 through May 3, and kicks off with their popular Dinner by Dames event which showcases local female farmers, food artisans and bartenders. Portions of the proceeds of this event will go to AIDS Project RI. The Grand Tasting features a variety of locally produced wine, beer and spirits, as well as tons of local food artisans. To find out what exhibitors will be showcasing their mouthwatering offerings visit the Exhibitor Page on the Eat Drink RI website.